Marital settlement agreements offer divorcing spouses the opportunity to shape their divorce to their own unique needs. In an atypical case shaped by the parties’ marital settlement agreement (MSA), the New Jersey Appellate Division ordered that an alimony payor receive a hearing on whether he should be granted the termination of alimony that he requested. Read on to learn about the case, and contact a seasoned New Jersey divorce lawyer with any additional questions. The recently-decided case of Salvatore v. Salvatore was based on a divorce that was finalized in 2011. The couple’s MSA stated that the husband would pay monthly alimony to the wife until one of the following events occurred: the wife remarried, the husband turned 66, or either party died. The MSA stated that “cohabitation with an unrelated adult tantamount to marriage” would be an occasion to reevaluate the payment of alimony. This is often an event that results in the termination of alimony, not just a reevaluation, under New Jersey law. The wife notified the husband later in 2011 that she planned to move in with her boyfriend. The husband and wife then negotiated an addendum to their MSA agreeing to the cohabitation and explaining that, “without sufficient knowledge to determine whether the cohabitation [would] be temporary or permanent,” that they would simply reduce the amount of alimony the wife would receive by roughly 25% during the cohabitation. If the cohabitation terminated before some other terminating event, then full alimony payments would be reinstated. Six years later, the wife and her boyfriend were still living together, and the husband filed a motion to terminate his alimony obligation. The trial court judge rejected the request and declined to hold a hearing. In his opinion the judge wrote that, since the creation of the addendum to the MSA when the couple moved in together, the husband hadn’t alleged a change in circumstances, financial or otherwise, warranting termination of alimony. The husband appealed. The Appellate Division sided with the husband and sent the case back to the trial court for a hearing on whether to terminate alimony. The trial court considered the MSA addendum to be the “reevaluation” upon cohabitation that was called for in the original MSA. However, the Appellate Division explained that, since the MSA addendum treated the wife’s cohabitation as possibly temporary and not necessarily a cohabitation “tantamount to marriage,” it anticipated that alimony would be reevaluated if the cohabitation lasted. 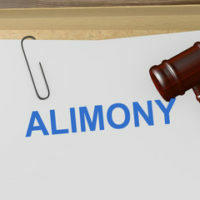 Since it did, in fact, last, and after six years could now be considered “tantamount to marriage,” the husband was entitled to a hearing on whether alimony should be terminated altogether. If you are planning to divorce in New Jersey, get seasoned, professional, and compassionate legal guidance on your divorce by contacting the Union law offices of family law attorney John B. D’Alessandro for a consultation, at 908-964-0102.